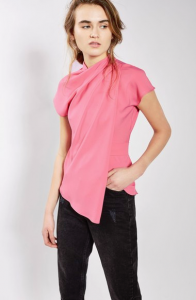 Recently the topic of spring trends arose and I remained a bit mum on the subject as I largely felt Spring 2017 offered a lot of “been there, done that” styles. Furthermore, some of the top runways looks – neon, bra tops, etc. just aren’t wearable for most us on a day-to-day basis. But today I decided to sit down and cherry pick a few top trends and identify ways to give a fresh spin to the styles that have been around a couple seasons. Athleisure: While this has certainly been around for awhile now, I still like this trend because it’s easy to wear and comfortable. Integrating another trend into the look (florals, stripes, flat mules), keeps the outfit fresh. Floral: Shocker, right? Florals for spring? Who’d ever have thought of that? Keeping it current in 2017 is the arrangement of florals in a patchwork arrangement. Exposed Shoulders: Again, we’ve been seeing the cold shoulder/one shoulder look for a few seasons. While I still love this chambray top, highlighted in an earlier post, the newest way to wear this look is as a traditional button-down or oxford. While the first photo better exemplifies the look, the second pop-over style seems a bit easier to wear. Embroidery: On tops, jeans, shoes and boots…. 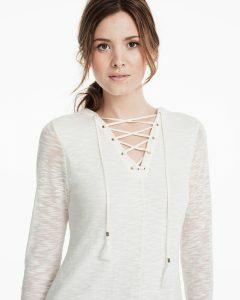 Lacing Details: This trend started coming on strong this fall and is continuing into spring. An easy way to revitalize bland basics! 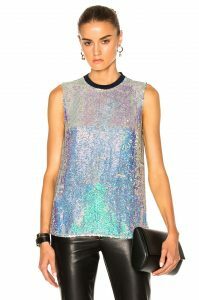 Iridescence: These sparkling, watercolor toned finishes are popping up on everything from cocktail dresses to swim wear! 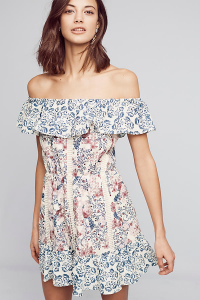 Ruffles: Yet another trend going nowhere fast are ruffles. On shirts, skirts, dresses and more; this look continues to hang around. I like the juxtaposition of a feminine ruffle combined with a darker color and masculine plaid in this top. Origami Details: From paper bag waists to distinctive drapes and folds, clothing with these origami like details tend to be simple yet interesting. Pantone’s fashion colors for Spring 2017 are shown below. Of these, pinks seem to be the most prominent runway choice for spring and I’m guessing we’ll start seeing a good bit in greenery – Pantone’s 2017 Color of the Year. Khaki is coming on strong as a top foundation color/neutral. Friday we’ll cover trends for spring accessories: jewelry, handbags and shoes!